This painting by Keven Wilder is three feet square. It is monochrome; painted with only two tools, a wide brush and a wide squeegee. And it is immediately appealing. Monochrome: the artist used only one color, red, and then the same red mixed with white for a paler, heathery red near the border. The red was applied with a flat 3” brush. Then came the squeegee. While the red was still wet (this is oil paint) the 3” squeegee, loaded with white paint, deposited white paint in the center of the painting, scraping some red into it in the process. Appealing. The painting is immediately moving and intriguing. How can that be? How can something be intriguing, when it can be described so easily, even mechanically? The second reason is that the strokes of the brush and squeegee are the opposite of sensuous. They are abrupt, quick, random, indifferent, angular, flat, rational, raggedy. These two qualities, red and rational, are contradictory. That contradiction creates drama in this painting. You can deconstruct this all you want. But the painting is not a well-argued paragraph in a debate or a dissertation at the Sorbonne. It’s a paradox. The paradox is to be inhabited. And once you’re in it, you’ll be scintillating and lose your self. *I want to talk about red in greater depth in future posts: symbolism, psychology, history, language. Next, let’s run this painting through different hues. What’s special about red? We’ll see about that! I love not knowing what to say about a painting. It’s a sign that I’m really looking. The top layer of this painting consists of the horizontal dashes. The effect is two-fold. Because they’re on top you feel you need to look at them. But when you focus on them you realize there’s nothing to look at. This makes you focus on the layers under the dashes. But the dashes obscure that layer. You soon realize that there’s no clarity in the lower layers either. The reason you don’t give up is that the effect of this layering is scintillating. The painting shimmers, not like metallic kitsch, not at all. It shimmers epistemologically. As soon as you think you’ve grasped it, it slips away. There are certain brains that love this effect. Count me in. There are twelve people in the Mondrian group and every one of these artist/students has a different approach. We admire each other’s work, but do our own thing. This is enormously satisfying to me. Here’s Keven Wilder’s first painting of this fall term, oil on canvas, 36” x 36.” The under-painting is red. The red lines were scraped in while the greens were still wet. Making a statement by a process of subtraction is exhilarating. You don’t see this in the reproduction or at a distance. You have to move in close and then the red lines strike like a revelation, which, in fact, they are. I invite you to see this saying-something-by-not-saying as a key to entering abstraction. One of the painters in my “What Would Mondrian Do?” group often brings photos of flowers and trees to class to kick off a painting session. Keven Wilder is an accomplished painter. 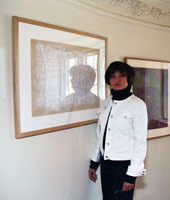 The collectors of her work eagerly follow her latest output. The reception of this painting has been enthusiastic. I’m glad. I find the enthusiastic response of non-representational art very encouraging. It’s a measure of progress in human consciousness, I think, not to be tied to the literal. People who love this painting love it even after they find out that the artist started with a photo of trees against a clear sky. They don’t get hung up on trees. Sorry there. 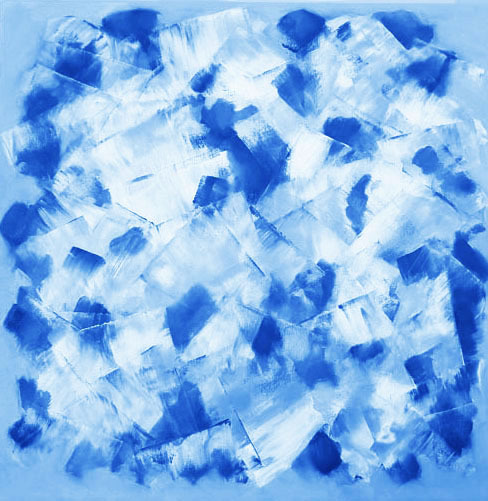 People who love this painting love its color, shapes, texture, process, surprises. It’s not an illustration, abstraction or diagram of anything. It’s an object in itself. Keven Wilder showed this painting at the Ethical Humanist Society earlier this year. It’s not confetti, silly. If that association comes to mind, it’s not going to stick. Keep looking. Just look. You’ll make some feeble attempts to figure out “what this is supposed to be” and your brain will give up. That’s good. Now keep looking. Roughly, this painting can be categorized as Op Art. 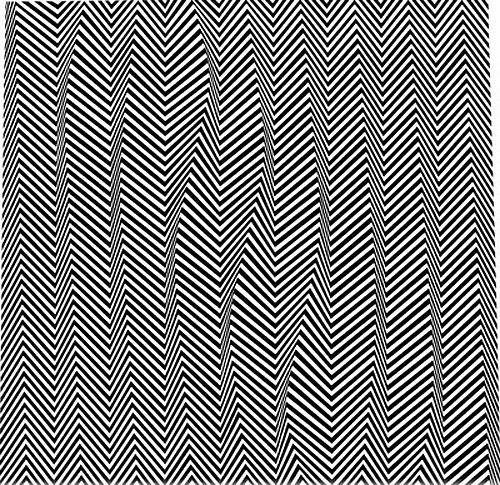 You don’t interpret op art. You keep looking and then your optic nerve goes into overdrive so that you experience a visual hallucination. 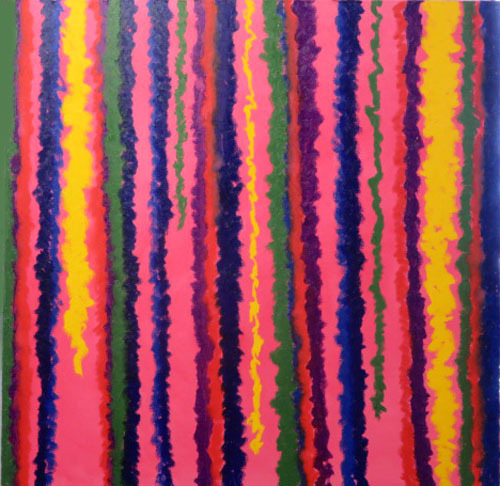 Bridget Riley (b. 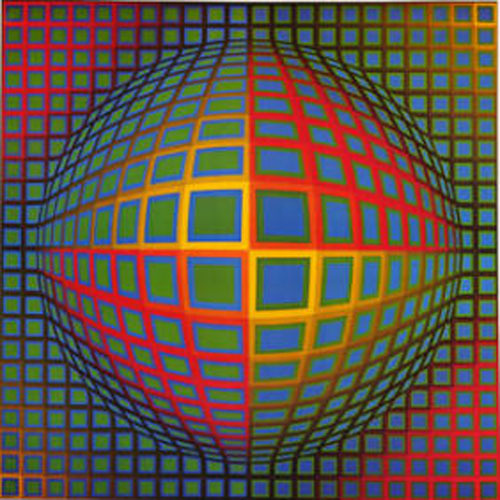 1931)and Victor Vasarely (1906-1997) are the masters of this genre. You can’t interpret the image, but you can certainly be sobered by the tricks your imperfect perceptual apparatus plays on your mind. Sit back and spend a few minutes (or seconds?) gazing at one of these paintings. Get your cranium hosed out.